Aya. Map of planet surface for Mass Effect Andromeda Video Game. Atlas with Maps, Game Guide and Walkthrough. 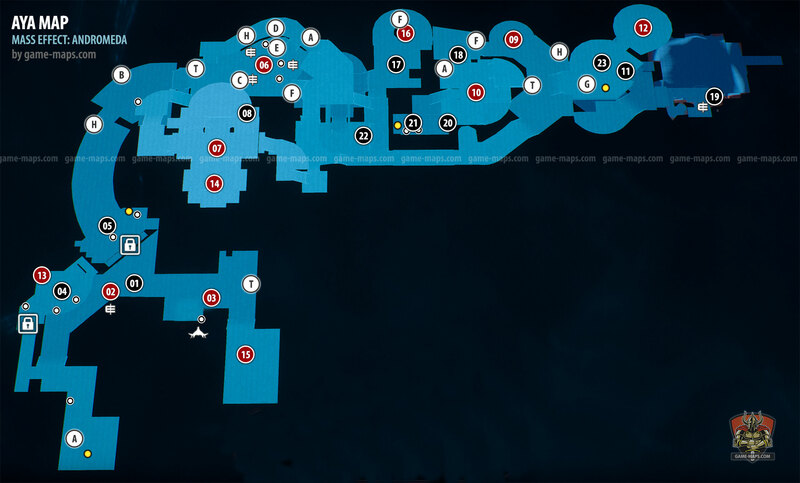 Map contains Quest Starters, Forward Stations, POIs Interesting locations, Remnant Monoliths, Remnant Vaults, Kett Base, Hidden Caches, Caves, Memory Triggers, Remnant Architect, Remnant Decryption Puzzles, Resources, Raw Materials and other secrets. Aya is an anomaly in the Heleus Cluster: a lush planet where a Remnant site appears to be active. It is a sanctuary for the angara, the only known sentient species local to Heleus, and guarded fiercely against Outsiders. This is helped by Aya's position relative to Heleus black hole, whose gravitational lensing effect makes Aya harder to detect. The Scourge also makes the approach to Aya extremely dangerous for untrained pilots. Scans indicate numerous kett wrecks lost in the Scourge nearby, picked clean by angaran salvagers. Aya is also the headquarters of the Angaran Resistance movement against the kett, whose leaders advise Aya's planetary governor, Paaran Shie. Director Tann has ordered that Aya is not only to be Considered Sovereign territory, but a military power. Priority Mission: A Trail of Hope leads to the Onaon System. During the flight, you encounter Kett's fleet which is commanded by The Archon. You manage to escape and land on the planet Aya. You've made contact with the angara and met Evfra, the leader of the Resistance. However, the angara don't trust you and without their trust, they refuse to give you access to the vault on Aya. Do not do anything suspicious, do not scan do not look around when you follow Paaran Shie. Jaal Ama Darav new member of your team. At the moment you can only visit the docks. Closed passages will open later when you gain Aya's trust. Sohkaa Esof you will be able to trade with him after finishing quest. Avela Kjar, curator for the Repository of History on Aya, has asked you to investigate an ancient crashed shuttle on Havarl and recover any artifacts. After A Trail Of Hope, Havarl and Voeld parts. Take shuttle with Moshae to the Aya Vault. An angaran arbiter in Aya's marketplace advises you to learn the laws and customs of her people. She has directed you to visit two other arbiters in the city for more information. SAM identified an angara who was scanning you without permission on Aya. Speak to this person and learn why. Avela Kjar talk to her about Recovering the Past. Avela Kjar suspected there are angaran artifacts hidden on the planets of Heleus. Search the planets and recover lost relics. Search Voeld for and angaran relic. Examine Museum, talk to visitors. The Moshae says the Archon has a Remnant map that may point the way to Meridian. But you don't know where his ship is. You must first track down the angaran traitor, Vehn Terev, on Kadara Port, and learn what you can from him. Go to Kadara Port in the Govorkam system. Speak to the Resistance contact at Kralla's Song. Maariko, Aya's chief astronomer, requests help locating several missing satellites essential to monitoring the Scourge. Fly the Tempest to Maariko's Satellite navpoints and search the areas. Now you can trade with Sohkaa Esof. Ambassador Rialla, leader of the initiative's embassy on Aya, reports that an angara from the Resistance has threatened a salarian scientist named Sorvis Lenn. She has asked you to resolve this matter discreetly. Director Tann has suggested strengthening ties between the Initiative and Aya by allowing angaran volunteers to live on the Nexus. Several angara have expressed interest, and Ambassador Rialla has tasked you with interviewing each candidate. Merixus says people at the Kadara Port outpost are suffering from a widespread bacterial infection. This bacteria is native to Heleus, so perhaps angaran antibiotics can treat it. Merixus has informed you that the Voeld outpost has requested an angaran solar amplifier to aid with energy production. He believes one can be purchased in the city, but still has no clearance to enter. He hopes you can obtain it for him. Avela Kjar talk to her about Forgotten History. Find rare Remnant tech so Peebee perfect her scanner. Talk to them for Jaal Ama Darav: Friend or Foe? Return to Merixus Aya 15 to finish three supply quests.